If you have an Illinois permit and love visiting Texas I have some great news for you. 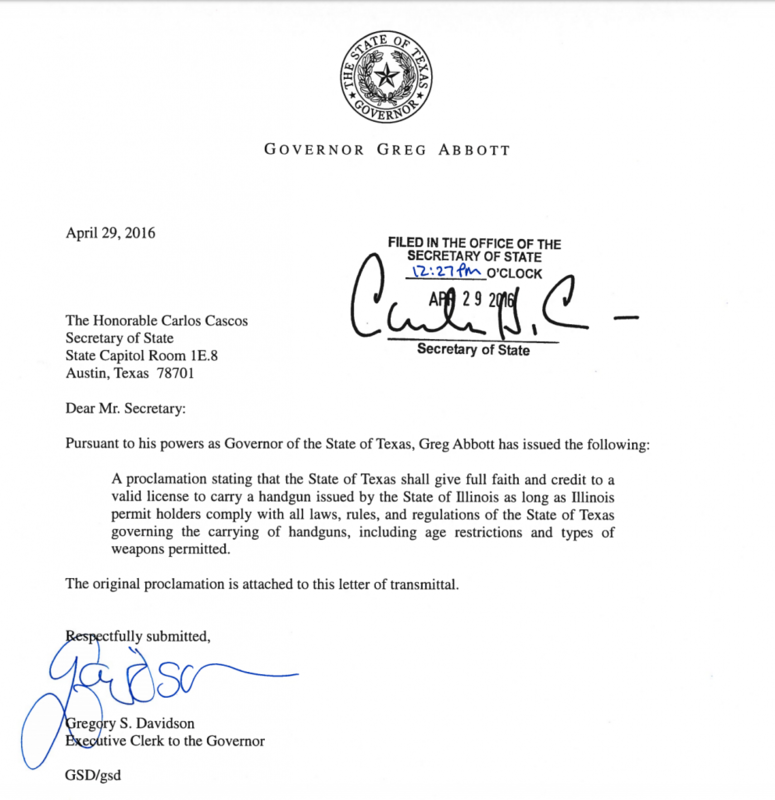 Effective April 29th Governor Greg Abbott has announced Texas will begin honoring the concealed carry permit from Illinois. I've included below a copy of the proclamation. But does Illinois accept Texas permits? Every state should recognize another states carry permit. Mark the answer is yes. Texas grants all privileges to anyone with an honored permit as they do to those with the local resident permit. If they (states) do no recognize Texas concealed handgun permit, we should not recognize theirs. But, it’s all about the almighty tourist dollar. Politicians! I understand your feelings but we the citizens are not responsible for our lawmakers, I vote with no change in ok because of liberal Chicago and there bureavrats, we do not exapand our gun rights by taking away from other states. We must look at long term goals and that is universal ccw in all states!!! How do you figure Texas,hindering Illinois permit makes Texas a penny. They don’t charge you to carry in their state they just honor your right to defend yourself and family. Now if the state of Illinois would only do the same. And I want to make sure I’m understanding you correctly. Its ok for me to open carry In Texas ? Ken, yes it is. The open carry law applies to any honored concealed carry permit. So you can carry in the same way and in the same places as someone with a Texas License to Carry. But please note there are restrictions but those restrictions are not unique to you… the are the same for anyone with an honored permit including locals with the local license. Why would you want to. You can but why take the best thing you have on your side and that is thhe element of suprise.